Multivariate statistics and mathematical models provide flexible and powerful tools essential in most disciplines. Nevertheless, many practicing researchers lack an adequate knowledge of these techniques, or did once know the techniques, but have not been able to keep abreast of new developments. 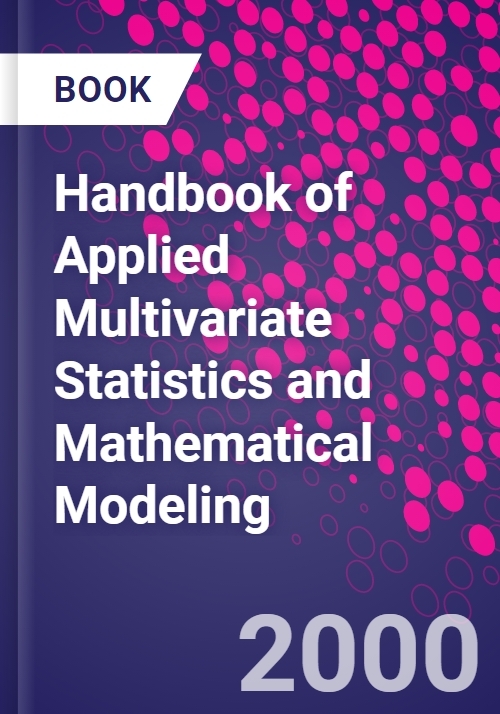 The Handbook of Applied Multivariate Statistics and Mathematical Modeling explains the appropriate uses of multivariate procedures and mathematical modeling techniques, and prescribe practices that enable applied researchers to use these procedures effectively without needing to concern themselves with the mathematical basis. The Handbook emphasizes using models and statistics as tools. The objective of the book is to inform readers about which tool to use to accomplish which task. Each chapter begins with a discussion of what kinds of questions a particular technique can and cannot answer. As multivariate statistics and modeling techniques are useful across disciplines, these examples include issues of concern in biological and social sciences as well as the humanities. Introduction.H.E.A. Tinsley and S.D. Brown, Multivariate Statistics and Mathematical Modeling.J. Hetherington, Role of Theory and Experimental Design in Multivariate Analysis and Mathematical Modeling.R.V. Dawis, Scale Construction and Psychometric Considerations.H.E.A. Tinsley and D.J. Weiss, Interrater Reliability and Agreement.M. Hallahan and R. Rosenthal, Interpreting and Reporting Results.A. Venter and S.E. Maxwell, Issues in the Use and Application of Multiple Regression Analysis.C.J. Huberty and M.D. Petoskey, Multivariate Analysis of Variance and Covariance.M.T. Brown and L.R. Wicker, Discriminant Analysis.R.M. Thorndike, Canonical Correlation Analysis.R. Cudeck, Exploratory Factor Analysis.P.A. Gore, Jr., Cluster Analysis.M.L. Davison and S.G. Sireci, Multidimensional Scaling.M.M. Mark, C.S. Reichardt, and L.J. Sanna, Time-Series Designs and Analyses.P.B. Imrey, Poisson Regression, Logistic Regression, and Loglinear Models for Random Counts.L.F. Dilalla, Structural Equation Modeling: Uses and Issues.R.H. Hoyle, Confirmatory Factor Analysis.B.J. Becker, Multivariate Meta-analysis.G.A. Marcoulides, Generalizability Theory.R.K. Hambelton, F. Robin, and D. Xing, Item Response Models for the Analysis of Educational and Psychological Test Data.L. Dumenci, Multitrait-Multimethod Analysis.I.G.G. Kreft, Using Random Coefficient Linear Models for the Analysis of Hierarchically Nested Data.T.J.G. Tracey, Analysis of Circumplex Models.J.B. Willett and M.K. Keiley, Using Covariance Structure Analysis to Model Change over Time.